What a surprise to find among the young vines a handful of green beans ready for picking. Most were eaten right in the garden but I saved a few to photograph for showing off purposes, then I ate those too! Everything is growing bushy and big, and this is just the first of what I hope will be many harvests this season. The lavender is in full bloom too. I love all the different colored and scented bushes we have at our community garden. Particularly the white lavender which is less intense than it’s deep purple “grasso” neighbor and more sweet than spicy. There are lots of things you can do with lavender, but making lavender salt and sugar is very easy. 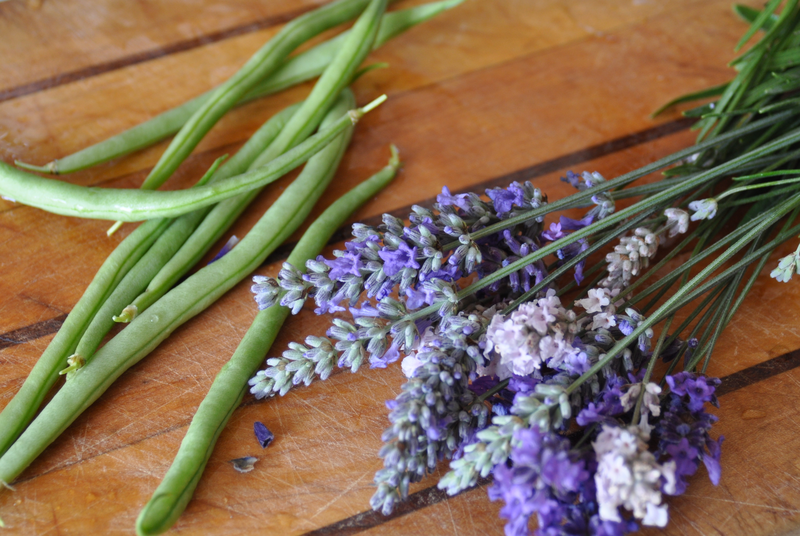 Hang the lavender upside down to dry (preferably in a dark place) and simply crumble the petals into the sugar or salt. They will infuse it with a subtle lavender scent. I use the salt for salt scrub and in some meat dishes. The sugar is wonderful sprinkled on shortbread. I also like to take a few tablespoons and grind the sugar and the dried lavender fine in a mortar and pestle to frost the rim of a glass of lemonade. The lavender smell and flavor is intensified. Feels like summer. Since I started getting donations of Meyer Lemons and Kumquats from my Grandmothers and other neighbors backyards, I’ve been looking for something to make that would be tasty and would keep for later in the year. I tried Lemon Curd, which though delicious, is tricky to make and doesn’t keep well unless canned and processed. (more about canning aspirations later) I tried saving juice in ice cube trays and the zest in ziplocs in the freezer. The juice doesn’t freeze well and usually sits around too long when you’re using it one cube at a time. Frozen zest on the other hand lasts but doesn’t taste like anything when thawed. What to do with the excesses of a California winter citrus crop? Bitter, tart, sweet, slightly caramel, highly addictive. Marmalade! I’ve always loved it and wanted to try making it. So many challenges! Number one is having mad knife skills to cut the peel into thin shreds. But first you have to get rid of the super bitter white pith on the inside of the peel, which is a whole new skill set in and of itself. It was fun though, practicing on the dozen or so fruits on my counter. Now to the cooking. It goes in two phases. One is the softening of the peel and the rendering of the pectin. The second phase is the jam/marmalade making itself. First things first… put your shredded peel on a non reactive pot (stainless or enamel or glass) add the juice you set aside. Now take the pith, membranes and seeds you saved and tie them up in some cheesecloth. Put the cheesecloth bag in with the juice and peel. Add an equal amount of water to the amount of juice and bring the whole lot to a boil. Simmer for 10 to 30 minutes depending on how thick your peel was. You’ll know when it’s done because the peel will be tender and somewhat translucent. Pull the cheesecloth bag out and let it cool in a bowl until you can touch it. You can take a break now but before you do, measure what you have left after this first phase because then you can figure out how much sugar you need for the second phase. Phase two. Use approximately 7/8ths cup to 1 cup of sugar for each cup of liquid and peel you have. Be conservative and taste for sweetness before you use the maximum amount. My Meyer lemon marmalade took more sugar than my grapefruit or my orange. Dump the sugar, cooked peel and juice into the pot again. Put the fire on Med/High and bring to a boil. While it’s heating take your cooled cheesecloth of pith etc… and start squeezing it into the bowl. The thick cloudy liquid you get is the natural pectin contained in the citrus pith, seeds and membranes. Brilliant. No need to buy any store bought pectin. The fruit provides everything you need to make your marmalade thick and luscious. I used all I could get out of it, about 1/2 cup, for approximately 6 cups of marmalade. You could decide to measure out 1 or 2 tablespoons of pectin per cup of liquid. After you’ve added the pectin, boil the whole thing for 10 – 20 minutes until a drop of the marmalade holds it shape when set on a cold plate. That means it doesn’t run when you turn the plate sideways. If you have a candy thermometer you can use it for additional information. When it reads 220 degrees cook your marmalade for a bit longer to get it to set. Don’t cook it forever, even if it doesn’t seem like it’s set yet. It can get a too cooked flavor then and I’d rather have a fresher tasting marmalade even if it’s a bit runny. Let your marmalade cool down now and then fill your very clean and warm jars with it. 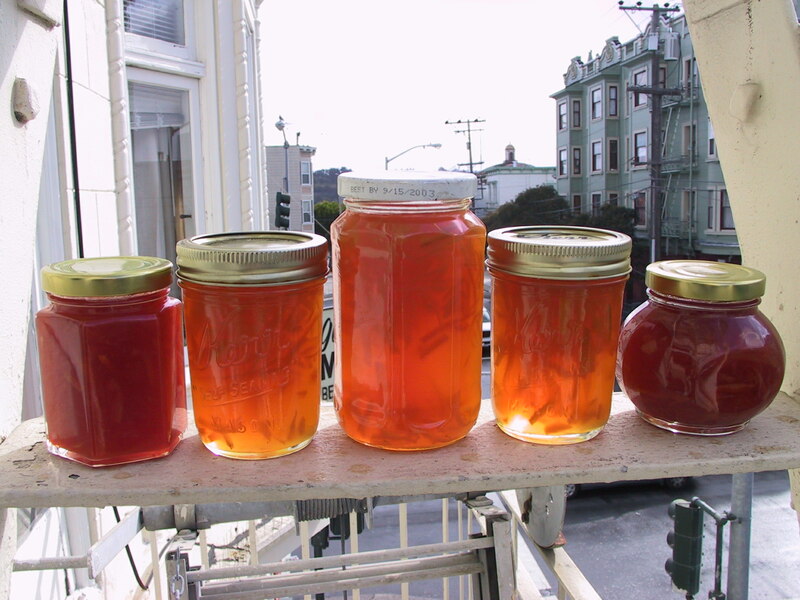 This marmalade is meant to be stored in the refrigerator or can be frozen until ready to eat. If you want to have it shelf stable you can process it in a water bath but that is for another post. You will eat this marmalade so fast it won’t have time to go bad and you should give some to your friends. Bourbon, 1	ounce fresh lemon juice, 3/4	ounce Simple Syrup, 1	teaspoon orange marmalade, 1	dash of orange bitters, 1	orange twist Fill a cocktail shaker with ice. Add all of the remaining ingredients except the orange twist and shake vigorously for 30 seconds to dissolve the marmalade. Strain into a chilled martini glass. Garnish with the orange twist. 1 1/2 Oz Reposado Tequila, 3/4 Oz Fresh Lime Juice, 3/4 Oz Cointreau, 2 Teaspoons Bitter Orange marmalade with peels, Juice of one Passion Fruit or other juicy fruit you like. Dissolve marmalade with lime juice in a mixing glass. Add the other ingredients, shake and double-strain into a chilled cocktail glass. and more… wherever you like a touch of sweet but with the complexity of citrus and bitter flavors, marmalade is perfect.